New to animation, not sure where to start. 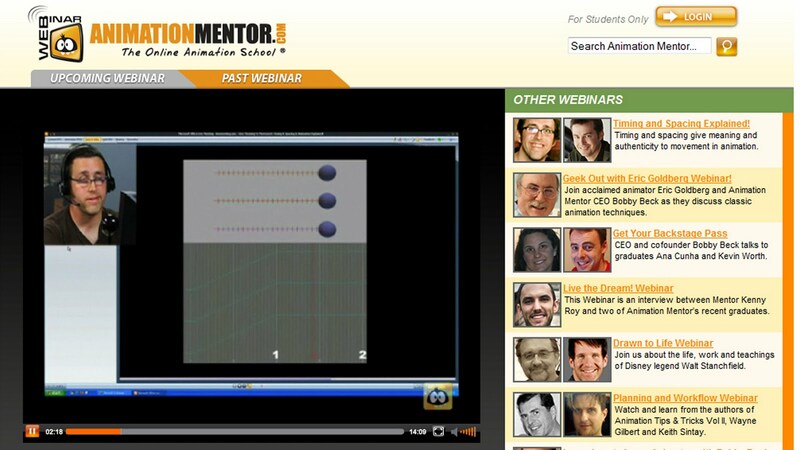 Why not try Animation Mentor's Timing and Spacing tutorial by Aaron Hartline. He starts pretty basic, introducing the idea that one second of film is 24 frames and how our role as animators is to make appealling use of that time. He then takes you through each one of the principles, showing their use in characters from Toy Story and Ice Age amongst others. 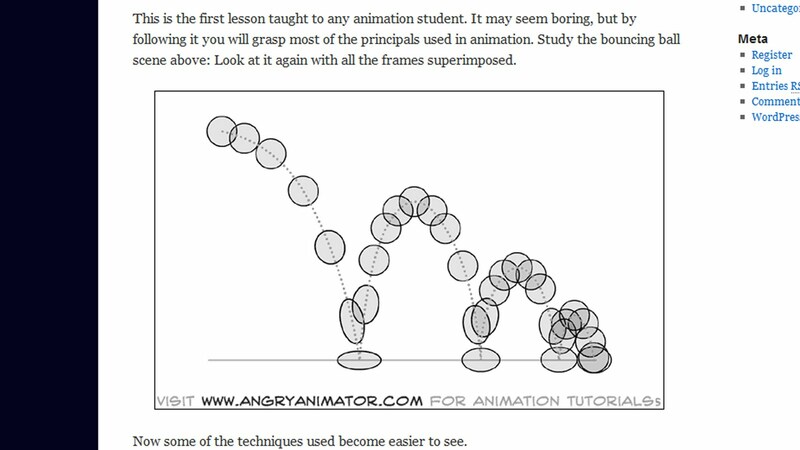 This tutorial is pretty basic, but it certainly helps refresh and re-inforce the most important aspects of animation. Brendan Body presents an Exploration, Analysis and Application of the Bouncing Ball. It takes you through how to develop weight in your ball and how the use of this knowledge transfers to more advanced animations, such as a walk cycle. 3) Finally Brendan discusses how to use this adapt the knowledge you've learnt to human, squirrels, bears, objects of all shapes and sizes. 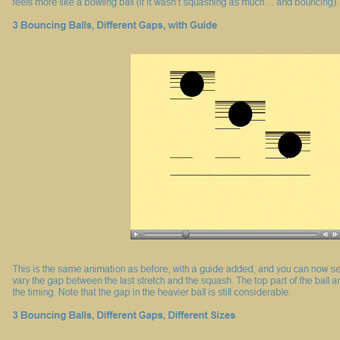 Francis Benjamin's case studies titled What does a Bouncing Ball can teach us about animation ? brings many different references together to present an interesting investigation into the bouncing ball. 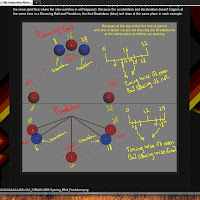 Francis has a number of other tutorials on his website which are well worth checking out, with particular merit being given his walk cycle tutorials. When an animator becomes angry, it is usually best to avoid, but this one is actually very user friendly. Dermot O’ Connor takes you through a number of excellent tutorials. Starting with the bouncing ball he introduces arcs, timing/spacing, squash and stretch, volume and also a great introduction to the 2d lightbox setup. 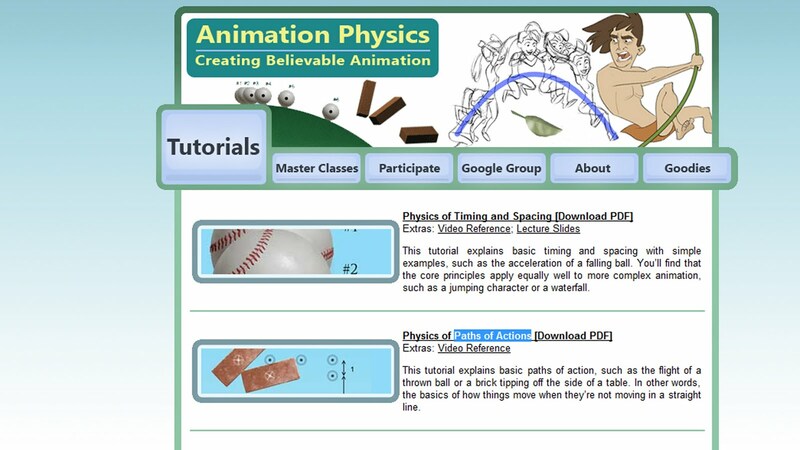 Ok the Animation Physics website is definately worth a view. By downloading the pdf tutorials on both 'Timing and Spacing' and 'Paths of Actions', this site offers so much to you whether you're 2d, 3d or stop motion artist. Exploring topics such as how much bounce a tennis ball would lose compared to a glass marble or brick, rotating of falling objects and the path of a leaf falling. I challenge anyone new to read both documents and not find something useful and exciting. Also check out the video reference on the site. 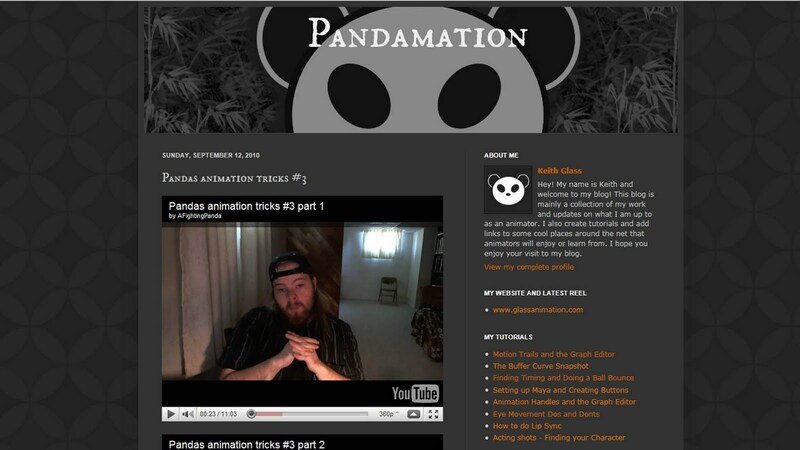 Introducing Keith Glass, aka AFightingPanda on the 11 second club forum. 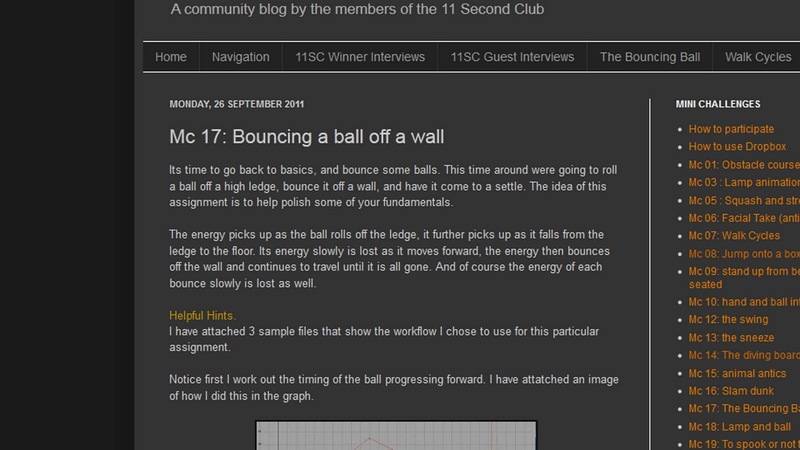 In September 2010, Pandas Animation Tricks #3 is a two part tutorial on how to produce a bouncing ball. I applaud this tutorial as it takes you back to the very basics. He even uses a stopwatch, which to some appears like to be a bit of an antique device. Yet, Keith is so right! It is too easy to grab a video camera and expect the computer to do the work for you. This process may seem slower, but its about building a strong foundation that the rest of your practice will build upon. This great tutorial was written for a mini-challenge in September. Lots of helpful advice, with a clear demonstration of how to approach the splines in the graph editor!